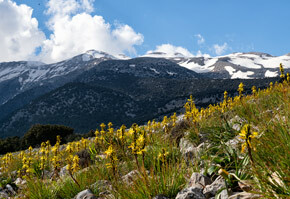 Crete's winter climate is similar to the South of Spain and Cyprus. These regions have the warmest winters in Europe but strangely, whilst South Spain and Cyprus are also winter destinations, there is no winter tourism in Crete between November and April. The climate in winter (see Crete's weather for November, December, January, February and March) is of course much milder than anywhere further north but apart from November it will not be suitable if you are looking for a beach holiday. It can still be a wonderful time to visit and escape the greyness of a northern European winter. At the moment (2019) there are no direct international winter flights to Crete so you will need to fly via Athens or Thessaloniki and catch a domestic flight to Heraklion or Chania. Being off season, prices can be quite low (but maybe not as low as very cheap charter flights) except during the Christmas to New Year time which is high season for most airlines. Alternatively you could also take the ferry from Piraeus. Make sure that you get a room with some form of heating. Day time temperatures can be very pleasant and warm but it gets cold at night. Using the heating function of an air-condition unit is OK but central heating is better. winter is a fantastic time to visit the most popular places that are totally overrun in summer. You can be in Knossos, Balos or Elafonisi more or less all by yourself. Museums will be open (with possibly shorter hours) and generally empty except for the occasional school group. beaches will be deserted. On sunny days you'll be able to sunbathe and even go for a short swim if you're not afraid of cold water. 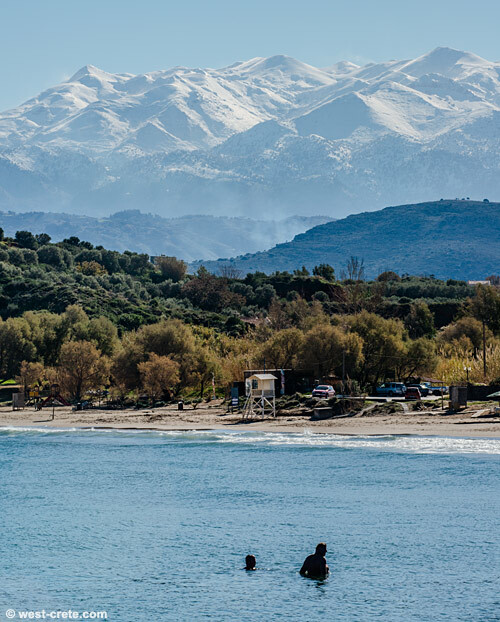 drive to the snow: Crete is one of the few places where you could be walking on snow in the morning and be on the beach in the afternoon. it's best to rent a car. You can get some very good value off-season deals and if the weather is not good you'll have the possibility to drive around and visit places. renting a villa could be a great option in winter but don't bother about a pool unless it is heated. A pool will cool off much quicker than the sea and will definitely be too cold from November or December onwards.